PHILADELPHIA -- The first three games of the Stanley Cup Final all have been won differently, one where offense rules, another were defense carried the day and the latest, which went to overtime. It seems like the coaches weren't kidding when they said it was pretty competitive on the ice. "You can't forecast scores," Chicago's Joel Quenneville said. "We have had a wild first game. A little bit lower scoring last game. This game is on the line from start to finish, as all three games have been. But it's entertaining hockey, and the pace is all out." "It's tight out there," his Philadelphia counterpart Peter Laviolette said. "It gets tight both ways. You really got to work for the scoring chances. It's not as wide open as you would think for two fast, hard-checking teams. It's hard-checking on defense too. There's not as much open room out there to create offensively as you would think. "The games, I think they're going to be tight," Laviolette said. "They (Blackhawks) probably feel like they could have won tonight. We felt, I told you earlier, I wasn't just giving lip service, we felt we could have won the two up there. It's good hockey. It moves back and forth quick." "It's very competitive," Quenneville agreed. "It's a fast-paced game. Fast-paced series. Both teams have some weapons that can attack offensively. I think they are respectful for their attack games as well." Finding leaders -- Mark Messier was at the Stanley Cup Final Wednesday and the Hall of Famer, now 49, looked like he could have been among the participants in Game 3. But Messier was on hand to name Shane Doan, Ryan Miller and Sidney Crosby as the finalists for this season's Mark Messier Leadership Award presented By Bridgestone. Messier praised Doan's leadership during the difficult early days of the season for the Coyotes, who faced an uncertain ownership situation. Messier lauded Miller for his play in the Olympics and called the Buffalo Sabres' goalie "perhaps the premier goalie in our game." Messier singled out Crosby especially for his leadership skills as a young captain. "I think it's obvious what he's been able to do in a short amount of time in this game, is nothing short of extraordinary," Messier said of Crosby. "I'm always leery about young players being named captain. I think it's obviously important for those players to have time to grow, to have time to make mistakes, not be put in position of leadership because it takes a tremendous amount of focus and concentration, not only for yourself, to get yourself prepared, but when you're in that position, you don't live one life, you live 25 lives. "It's amazing what he's been able to do all the while being a poster boy for the National Hockey League, going to two Stanley Cup Finals in the last two years, the game-winning goal in the Olympics this year, and just plays and composes himself so professionally on and off the ice." Presidential politics -- You know you're a hot commodity when the President of the United States mentions you and isn't even in the same town. That was the case Wednesday as U.S. President Barack Obama, speaking at Carnegie Mellon University in Pittsburgh mentioned hockey prominently in his remarks. "It is great to be back at Carnegie Mellon, and in the beautiful city of Pittsburgh," Obama said. "I love visiting a good sports town. Last year, I stole Dan Rooney to serve as my ambassador to Ireland. To make it up, I invited both the Steelers and the Penguins to the White House to celebrate their championships. "Seeing how the Blackhawks are headed to Philly tonight with a 2-0 lead in the Stanley Cup Finals, I'm just glad that we're on this side of the state. "I noticed a couple of people said they were rooting for the Blackhawks, which tells me something about the rivalry between Pittsburgh and Philly." 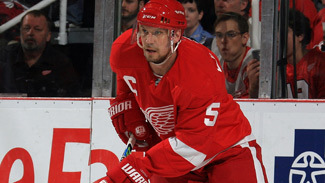 Lidstrom's return will be felt -- For the first time in a couple of seasons, the Detroit Red Wings are not at the Stanley Cup Final, but the news that defenseman Nicklas Lidstrom is coming back next season is a positive sign that the Wings are contemplating a return trip. "I get to watch him every day," Red Wings GM Ken Holland said. "I still think that Nick is the premier two-way defenseman in the world. There might be some player that maybe a little bit more productive offensively, but I think when you factor in how good Nick is defensively, how he played the last half of the year, certainly the last 30 games … I still think we have one -- if not the -- best defensemen in the world. It's a great day for Red Wings' fans." As effusive at that praise may seem, it also is understated when you measure what Lidstrom, 40, has meant and still means to the Red Wings. How good is Lidstrom? Consider he made news when he wasn't named a finalist for the Norris Trophy for just the second time in 12 years. "I really think, with all of the key injuries that we had in the first 60 games last year, there were three or four key reasons we were able to stay in the race," Holland said. "One was the structure that Mike Babcock put in place, one was the job that Jimmy Howard did, and I certainly think another was the job that Nick Lidstrom did as a leader off the ice and as a player on the ice." Lidstrom averaged more than 25 minutes per game in 2009-10 and finished tied for eighth among NHL defensemen in total points (49), tied for seventh in plus-minus (22), and seventh in shots (194). He holds the League's highest cumulative plus-minus rating (plus-431) since 1991-92, Lidstrom's rookie season. "He plays so much of the game in his head," Holland said. "It's his positioning. When he goes into the corner, it's his quick stick, and he knows how to poke and how to angle. He's physical when he needs to be physical, but for the most part, he doesn't play a physical game, because he's too smart." Numbers to note -- Here are some statistical trends worth noting as compiled by NHL.com's John Kreiser. 4 -- Consecutive overtime losses in the Stanley Cup Final for the Flyers before Wednesday night's victory. The Flyers won their first OT game in the Final in 1974, but had lost to Buffalo in 1975, twice to the Islanders in 1980 and once to Edmonton in 1987. 5 -- Victories, in as many tries during this year's playoffs, in one-goal games for the Blackhawks before Wednesday's 4-3 loss. The Hawks had been a perfect 10-0 in the playoffs in games decided by one or two goals. 6 -- Consecutive home playoff wins for the Flyers this year. They haven't lost at the Wachovia Center since a 4-1 loss to Boston in Game 3 of the Eastern Conference Semifinals.